Sarah Tasker has been busily involved in the Albuquerque music community since arriving there in 2008. 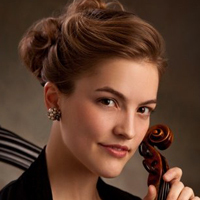 She is currently the assistant concertmaster of the New Mexico Philharmonic, where she has been a featured performer, and has enjoyed playing with the Santa Fe Symphony, The Santa Fe Opera, Santa Fe Pro Musica, Opera Southwest, San Juan Symphony, Albuquerque Chamber Soloists, and The Figueroa Music and Arts Project. Mentors instrumental in shaping her musicianship were Camilla Wicks from the San Francisco Conservatory, Linda Cerone at the Cleveland Institute of Music, and Masao Kawasaki at The Juilliard School. She has made several international orchestral performances in Western Europe, England, China, and Japan. Ms. Tasker has received honors in competitions throughout the US and Europe. In addition to playing, she enjoys teaching and trying to keep up with her three energetic children.